Mike Pagliarullo had worn out his welcome as the Yankees’ starting third baseman by the end of the 1980’s. Although everybody loved Pags’ desire and hustle, his batting average had declined every year he wore the pinstripes. When it fell to .197 in 1989, the Yankees shipped him to the Padres and used Tom Brookens, Randy Velarde and today’s Pinstripe Birthday celebrant to fill the hole the trade had left at the hot corner. Blowers had been a prospect in the Expos’ organization. 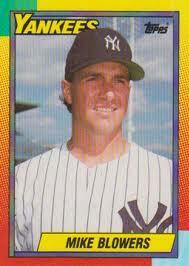 The Yankees sent pitcher John Candalaria to Montreal for the young infielder in August of 1989 and Yankee Manager, Bucky Dent played him at third in thirteen September games that season. The following year, Stump Merrill gave the kid a bonafide shot at winning the job but in 42 starts at the position, Blowers hit just .188. The following year, New York traded him to the Mariners. Though he was born in Germany, Blowers had been raised in the State of Washington, played baseball for the University of Washington and getting sent back home turned out to be a great move for his career. He became the Mariners starting third baseman in 1993 and hit .280 with 15 home runs. In 1995, his 23 home runs and 96 RBIs helped Seattle make the playoffs where they beat Buck Showalter’s New York Yankees in that year’s ALDS. His stats in Seattle were good enough to get him a $2.3 million contract from the Dodgers in 1996. He did not play well in Tinseltown and ended up finishing his career back with the Mariners. He eventually became a member of the Mariners’ TV broadcasting crew. Also born on this date is this Yankee relief pitcher who played in pinstripes during the late sixties, this Yankee outfielder, and this Yankee starting pitcher from the roaring 1920s.